Join us throughout the year for panels, workshops, social events, meetings and more that will help you continue to grow and keep you energized in your career and work! All are welcome (and members get special discounts). 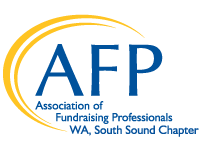 Event registration is managed through an AFPSS account on Eventbrite. You can locate all upcoming events and register using the calendar below. CFRE credit approval for past programs can be found here back through 2017. If you have questions about programs, please reach out to Program Committee Co-Chairs Jennie Griek (jgriek@playtacoma.org) and Missy Zenczak (missyz@uwpc.org).